The Mockingbird was one of the first, if not the first media outlets to cover the suspicious death of DNC staffer Seth Rich. This publication was the first to get and first to publish the police report. We had questions at the time with the official narrative, and we still do. Certain right wing conspiracy publications, notably including The Gateway Pundit, have their own doubts which they have spun into the ever interlocking web of weirdness that is the fake news industry. The Mockingbird does not endorse their claims, as those make even less sense than the official narrative. They have harassed Rich's family to the point of getting themselves sued. The fallout from those suits however, is a danger to journalism in general and advocacy journalism in particular. Seth Rich's brother, Aaron Rich, has a lawsuit, separate from his parent's suit against Fox News, directed primarily at The Gateway Pundit and Unification Church aligned Washington Times. Wikileaks however is a co defendant. That is where the fun begins. The only connection between Seth Rich and Wikileaks are accusations by the right-wing blogaspehre that Seth Rich was Wikileak's source for the Clinton email files, DNC Leaks, and/or Podesta Email files. That theory holds zero water, as Wikileaks has never made that claim about Seth Rich, and if one of Wikileak's sources came under attack, deadly or not, Julian Assange can be counted on to grandstand on it. He did not. Any and every journalist will always protect and defend their sources. If we can not assure a source that we will do this, we can not build the trust we need to have sources and can not do our jobs. An opening has been created by the gum flapping at the Gateway Pundit. 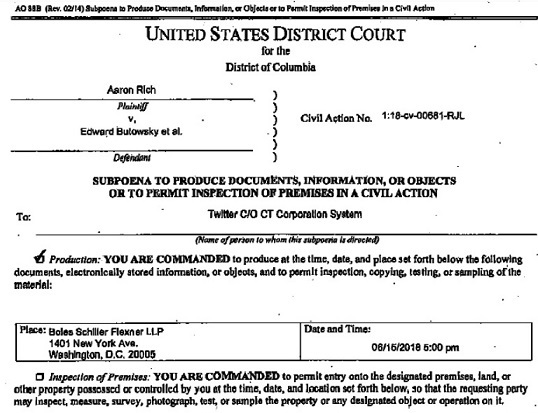 On June 1st Aaron Rich's legal team gained a subpoena for every tweet involving Wikileaks. Every. Single. One. The search would give them access to every account that has spoken to or about wikileaks, publicly or privately, on twitter. This includes deleted tweets and deleted direct messages. The freedom of the press implications are as big and chilling as the Ross Ice shelf in Antarctica. Unlike the Ross Ice Shelf, they are not going to shrink. Getting the relevant material does not require a subpoena at all. Twitter has a database of every single tweet. The database is called Firehose and it is available for purchase. It is one of twitter's primary material assets and was listed as such in the S-1 paperwork for the company's IPO. One of the defense contractors, GNIP, actually sells Firehose to the library of Congress. Aaron Rich's attorney's could literally just go to DC and look up what they actually need. They do not wish to do that. It appears instead that they are sending a message and this subpoena is part of an overall campaign that has little to do with the life and death of Seth Rich. The message being sent is that any discussion about Wikileaks will get ALL your private communications looked through. This will serve to keep journalists from mentioning Wikileaks in any favorable way. Doing so will now compromise ALL your sources on ALL your stories. The message is clear, be silent, discuss topics that are withing certain parameters, or else. The message to sources is clear, do not talk to journalists that have courage, because we will come after them to get you. This is a battering ram to the front door of public discourse.